This house couldn't be much closer to the water. 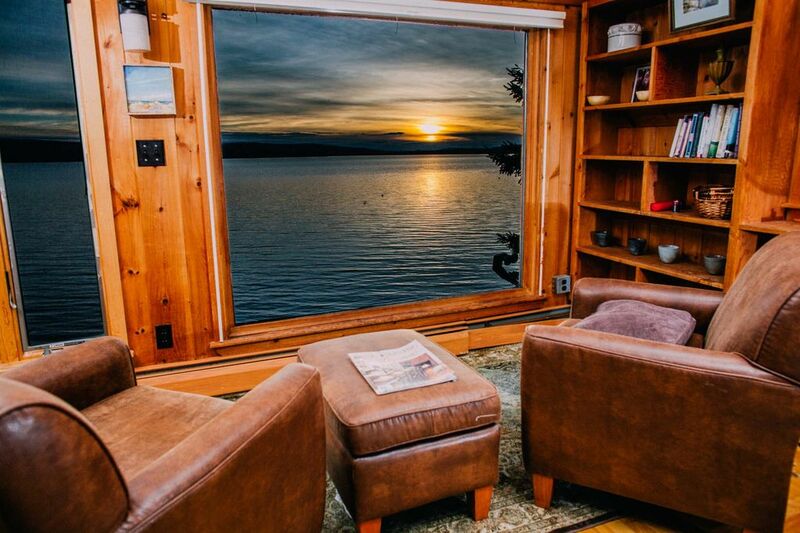 Enjoy huge windows exposing you directly to Rangeley Lake. This rental has it all for those trying to relax and enjoy life or have a vacation full of fun and adventure. This is a great home for larger families or groups looking to entertain people of all ages. Dish Choice Satellite Internet 15mb dl (fastest in the area). Born and raised in the White Mountains of New Hampshire I grew up with a love for the outdoors and everything it had to offer. Since then I have run or been involved with a number of business that have taken me westward to Lake Tahoe but I still consider the north east to be home. When my mom, brother and I first came across this home we knew it was the one. When you walk through the house for the first time it's almost impossible to get over the proximity of the lake. It feels as though Rangeley is in your living room. Add that to the permanent dock structure and state park across the way we knew this house was a keeper. This house sits 20 or so feet from the shore or Rangeley Lake. 15MB download satellite internet- fastest available in the area. There is another table that seats 4. You could put the leafs in the table in the main living room and easily accommodate 10 if you moved the chairs from the other table. Canoe included for summer 2015 with hopefully more on the way by the time the renters get there. My family and I had a fantastic time. This was our second stay here.you can not beat the views in this house. It feels like you are on the lake from the moment you step in the kitchen. Hiked Bald mountain and had an incredible time with family and friends. One morning a bald eagle landed on the dock and ate a fish in front of me. Amazing!!! Perfect spot to enjoy Rangeley and the surrounding area. My family & friends traveled to a different destination every year for the past 15+ yrs because we don’t want to have a “repeat vacation”. After staying at Lakeside lodge everyone said they would definitely repeat vaca here. This was the most relaxing vacation we ever had & we loved every minute of it! Words cannot express how overwhelmed we were by the beauty and peacefulness of this getaway. It was easy to put down the laptops, tablets, & cellphones in favor of the clean air & views. All the amenities kept all of us busy w/ some unforgettable memories, time well spent! Thank you Conor for letting us experience this & for being attentive w/ our stay. It was a sad time leaving, even the dogs miss it lol. This is the first time I have rented through VRBO and was pleased with the entire experience. The owner of this property was quick to reply with any questions that I had before booking and check in. The rental was more than I had hoped for. I love how this cabin still had the charm of an old Maine camp but all of the updates needed for a comfortable stay. We celebrated our Thanksgiving meal on the large table overlooking Rangeley Lake through a wall of large windows. It could not have been more perfect. I would recommend this rental and owner highly and I am holding to rebook for next year. My husband and I spent a wonderful week in this great, lakeside home. Even though the house was built a long time ago (that's why it sits so close to the lake), all the appliances large and small, and the televisions are new. The TV's receive all the channels, which was nice because we had one rainy day. The view from the front rooms is spectacular! The master bedroom bed was very comfortable. This was definitely not roughing it. Although we were there in October and the water was way too cold for swimming, there was no shortage of things to do in the area. We ran out of days before we ran out of things to do. We will be back in the summer next year for two weeks! We had wonderful weather and were able to use the canoe and kayaks so much. Watching the sunset over the lake was one of our favorite things to do. Great being able to have a campfire by the lake. What a wonderful lakefront property. Very enjoyable vacation. Looking Glass Property Mgt M.
We rented the lakehouse for a week and found it to be an exceptional place to base out of for exploring on land and water the Lake Rangeley area. Sitting in the chairs in front of the picture windows gets you as close as you can be to the water without getting wet. The pier and dock were perfect, as were the main deck immediately outside the house and the sunning deck at the base of the pier. We hated to leave.